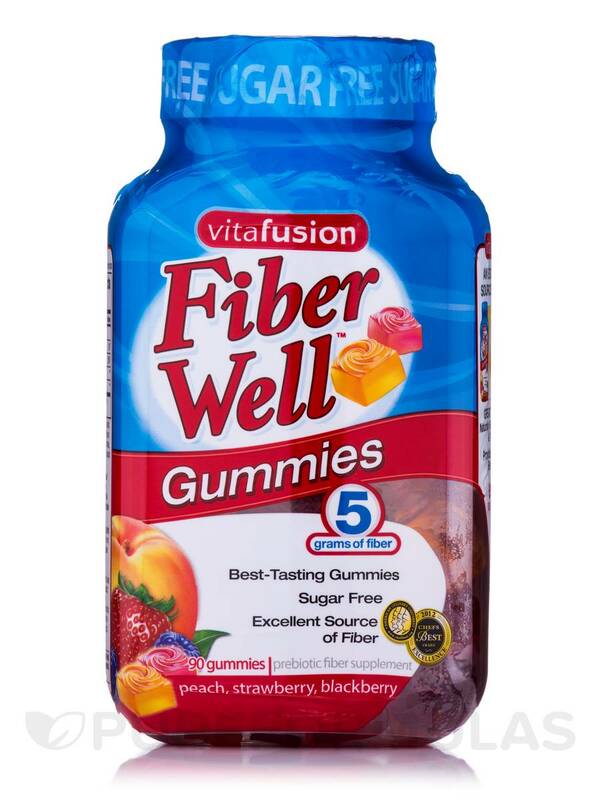 Fiber Well Gummies (Assorted Flavors) by Vitafusions are delicious and easy to use! 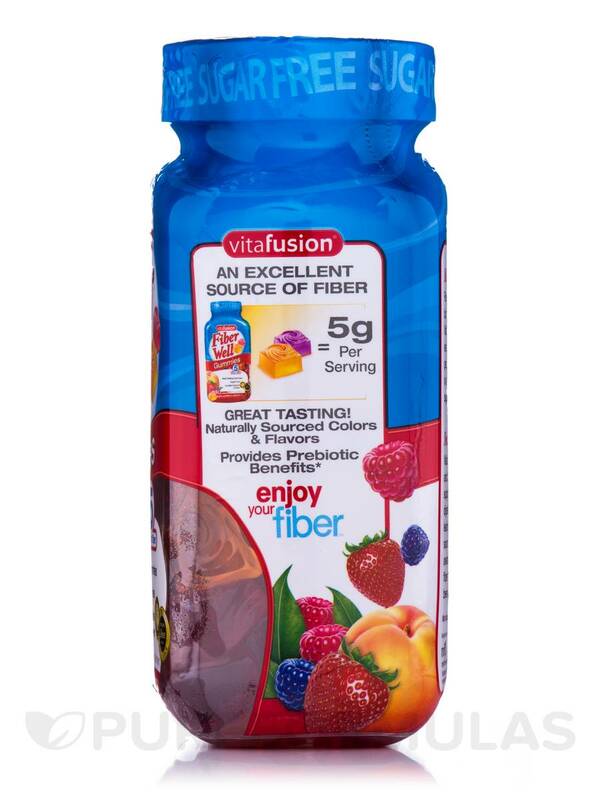 Support your digestive health and promote bowel movement with Fiber Well™ Gummies – 90 Gummies from Vitafusion™. This probiotic fiber supplement is free of soy‚ gluten‚ wheat‚ egg‚ milk‚ peanuts‚ and sugar. Polydextrose reportedly is a polysaccharide that is a combination of glucose and sorbitol. It could potentially provide important dietary fiber to the body and improve your gastrointestinal health. Studies reveal that polydextrose controls blood glucose levels in your body‚ aids bowel regularity‚ supports the growth of beneficial bacteria in your gut‚ and more. 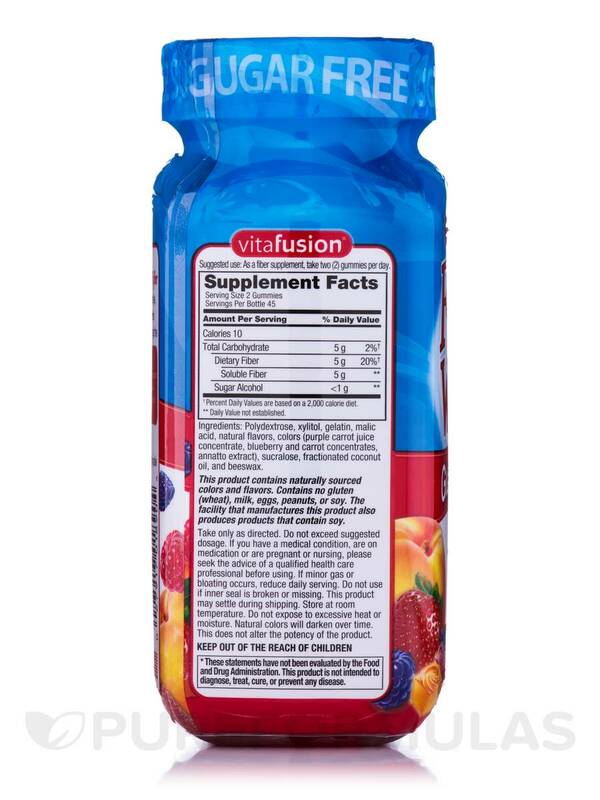 Include Fiber Well™ Gummies – 90 Gummies from Vitafusion™ in your daily diet and it may promote your gastrointestinal wellness‚ reduce body fat‚ and aid weight management. ƚPercent Daily Values are based on a 2‚000 calorie diet. Ingredients: Polydextrose‚ xylitol‚ gelatin‚ malic acid‚ natural flavors‚ colors (purple carrot juice concentrate‚ blueberry and carrot concentrates‚ annatto extract)‚ sucralose‚ fractionated coconut oil‚ and beeswax. This product contains naturally sourced colors and flavors. Contains no gluten (wheat)‚ milk‚ eggs‚ peanuts‚ or soy. The facility that manufactures this product also produces products that contain soy. 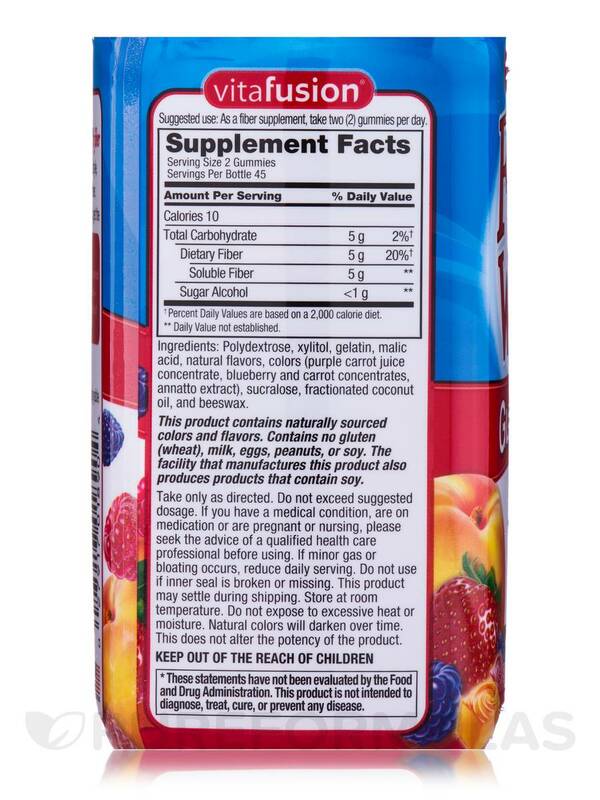 As a dietary supplement‚ take two (2) gummy vitamins per day. Chew thoroughly before swallowing. Take only as directed. Do not exceed suggested dosage. If you have a medical condition‚ are on medication or are pregnant or nursing‚ please seek the advice of a qualified health care professional before using. Do not use if inner seal is broken or missing. This product may settle during shipping. do not expose an excessive heat or moisture. Colors will darken over time. This not alter the potency of the product. 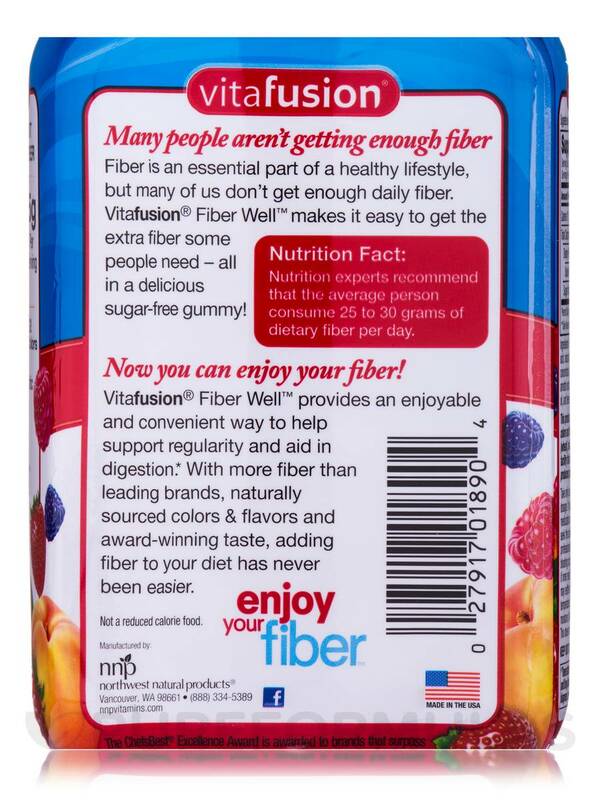 Sugar free, and is a tasty fiber. Sugar free, Works great, Good taste! 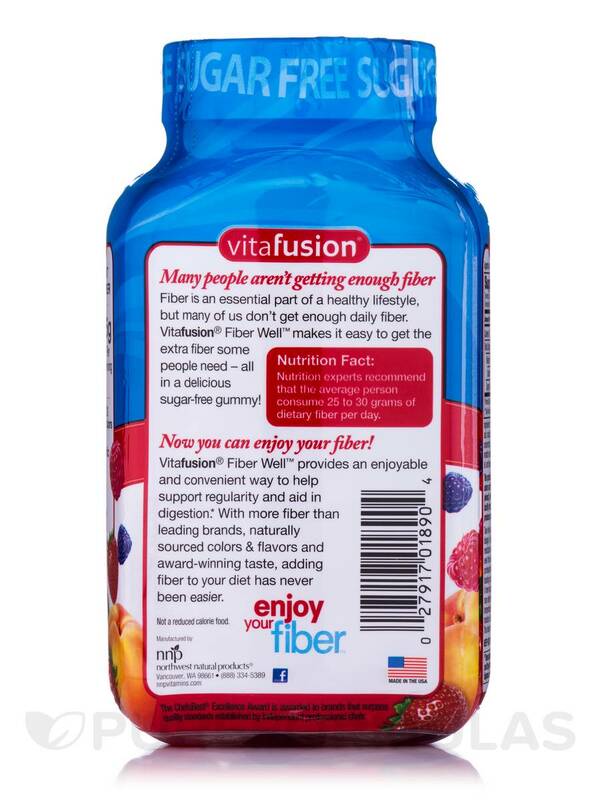 Fiber Well Gummies by Vitafusion is a great way to take fiber. No pills.